"THREE WEE WITCHES ON THE GREEN..."
Okay, so I lied about the witches - sue me. BRING ON THE BAD GUYS...TRICK OR TREAT? which are far too laboured, but it didn't come out too bad overall. DID YOU EVER WONDER ABOUT SUPERMAN'S "U"? 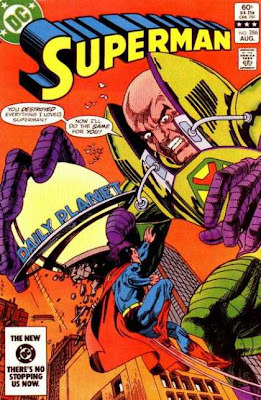 Superman #233, featuring Ira Schnapp's logo. 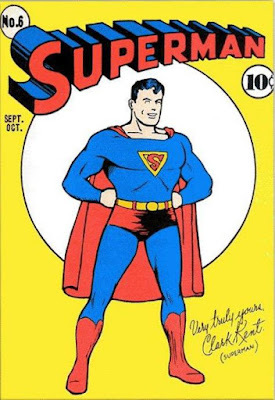 SUPERMAN's logo is as iconic as that of COCA COLA and is recognized the world over, but it took a little while before it was standardized by NATIONAL PUBLICATIONS' ace designer and calligrapher IRA SCHNAPP (on the cover of issue #6), based on JOE SHUSTER's original design. Did you ever wonder, however, why it had that peculiar shaped angular "U" which didn't ﻿﻿match any of the other letters? 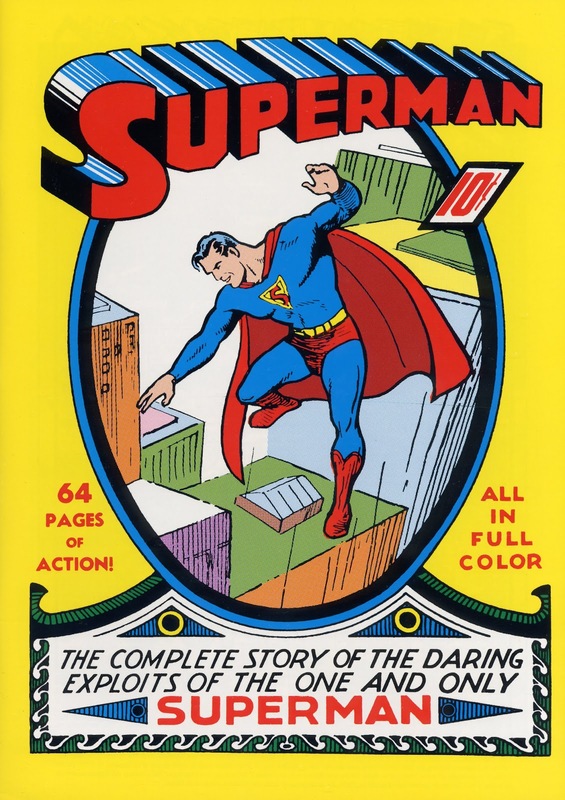 ﻿I thought I had solved the mystery when I first saw the cover of the Ashcan Edition of Superman (SUPERMAN COMICS), and noticed that the "C" of "Comics" cuts into the "U" of "Superman". Closer examination shows that the "U" had almost the same squarish curve (if that's not a contradiction in terms) as the "P" and the "R". 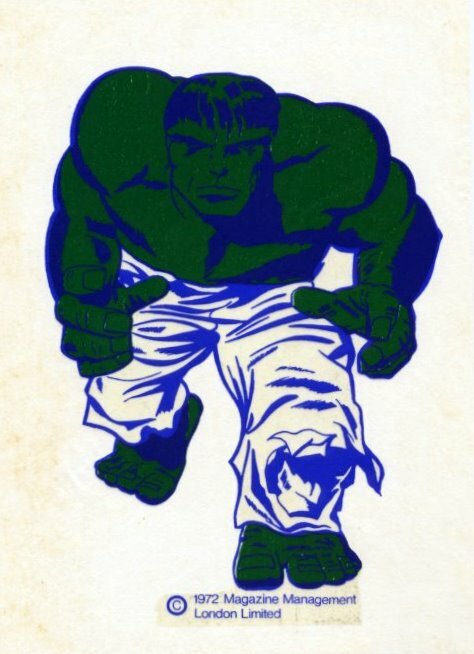 Was it simply a case of this rough logo being relettered for issue #1 with the word "Comics" omitted, and someone taking the easy way out by angling-off the letter to complete the bottom line of the "U"? 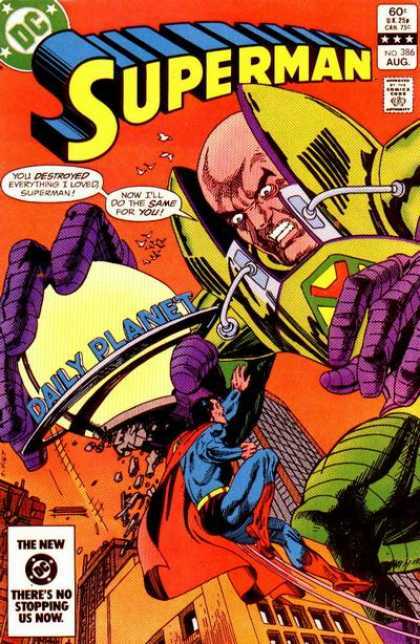 Superman #6. 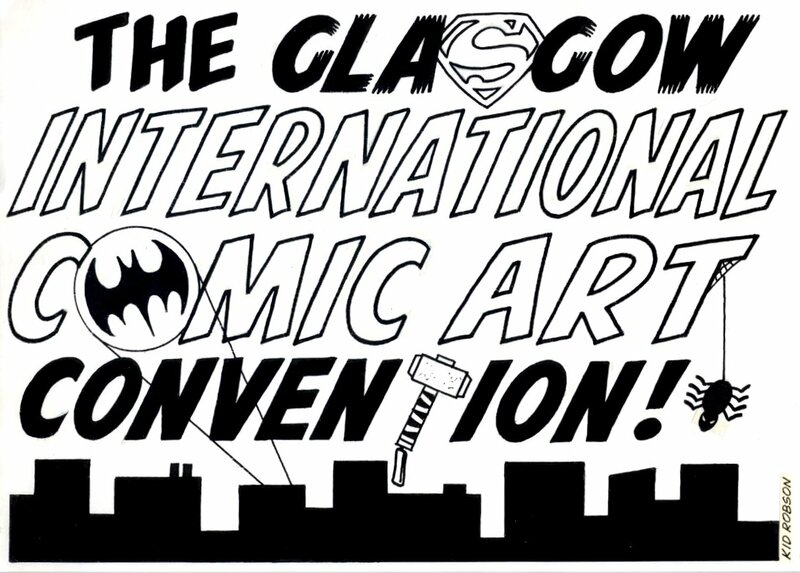 1st appearance of Ira's logo. 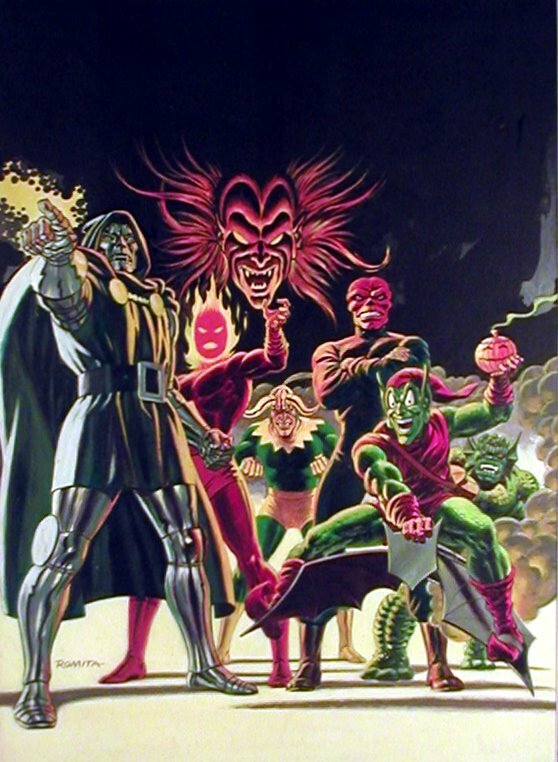 ﻿﻿It would be easy to assume so, going by the cover (and centre pages) of the actual first issue (which, legend has it, was originally intended as a one-off - hence the un-numbered cover). It therefore didn't seem unreasonable to suppose that, when Ira Schnapp came to letter the definitive version, he was provided with a printed copy of the then-relatively recent SUPERMAN #1 for reference. 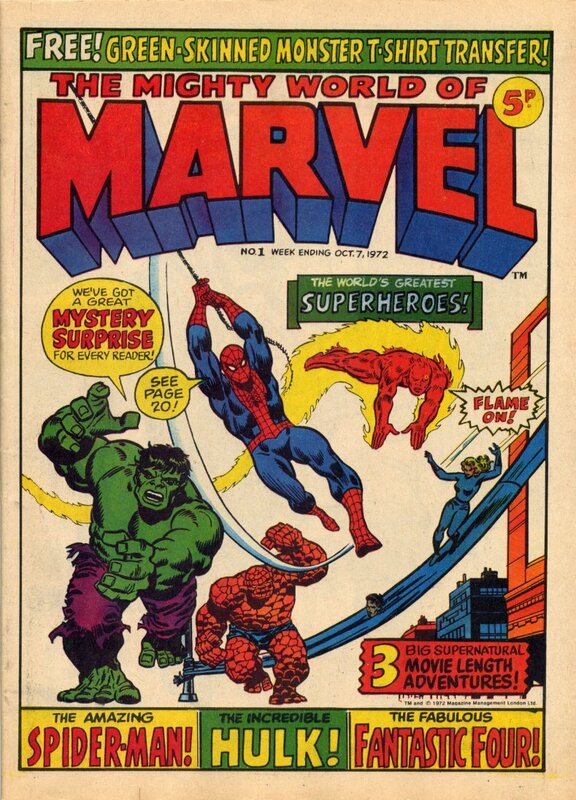 It certainly couldn't have been issues 2-5, as each cover logo featured a curved "U". (For the cover of issue #1, see previous post.) So - mystery solved? Well, no. Despite my fine speculations, after a bit more digging I found that JOE SHUSTER had occasionally rendered the "U" in that way from as early as ACTION COMICS #2 - which predates the Ashcan and the first issue by quite a margin. 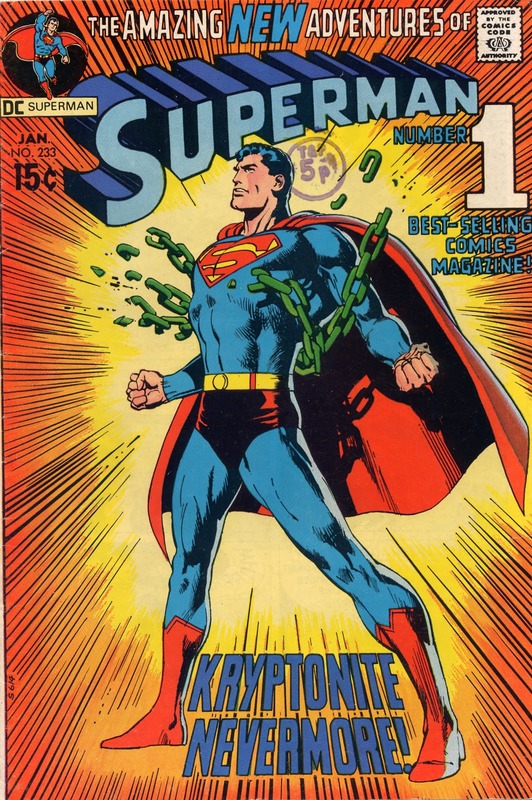 (As that story was actually reprinted in SUPERMAN #1, I could have saved myself needless hypothesizing by simply reading the comic.) It seems entirely possible, therefore, that Ira Schnapp was provided with a copy of the angular lettered logo for reference instead of the curved one merely on a whim of fate. 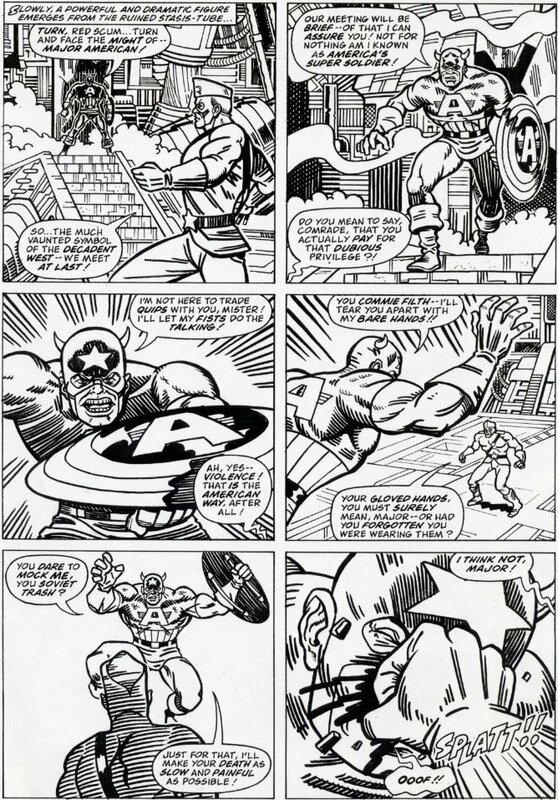 (Though I have to concede that, with it's distinctive "U", maybe the editor - or Ira himself - just preferred that version.) 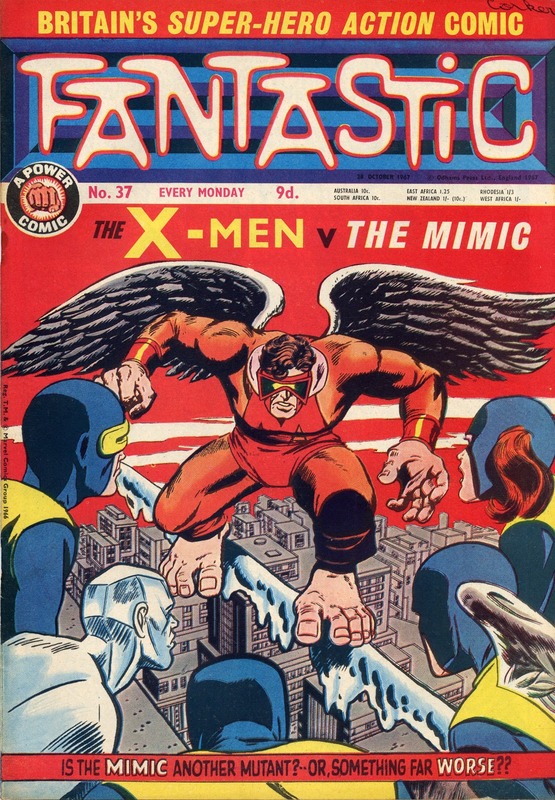 But just think - comics history could so easily have been different. ﻿Ira's logo lasted for over 40 years, until 1983, when it was relettered by MARSHALL ARISMAN to more closely resemble the earliest regular incarnations of the title. I actually think it's excellent, though I have reservations about the top curve of the "S" overlapping the top of the "U". Maybe one day I'll have a go at doing it. Now, be honest - did you ever wonder.....? 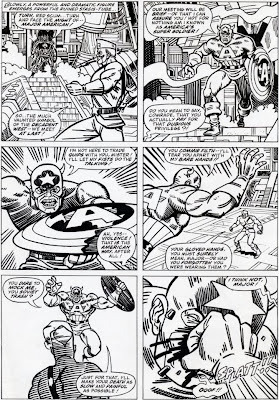 A COMICS CONTROVERSY - CARE TO COMMENT? Consider, if you will, fellow Criv-ites, the following scenario. A person buys an ornament for £2 from a charity shop. Later, upon reflection, they decide that they don't really like it, so when someone collecting for a jumble sale chaps their door, the ornament is handed over to help raise funds to repair a leaky church roof. Ten years later, the first person is watching ANTIQUES ROADSHOW and sees "their" ornament declared as being worth £20,000. Do they have a moral or legal claim on any of that money if the current owner decides to sell? Now consider this. Someone asks an artist to paint a picture of their house and gardens. He charges them £300 and is extremely pleased at the amount he has secured for himself. Five years later, a visitor to the purchaser's house is so enamoured of the painting that he offers them £5,000 for it. Over the years, it changes hands for increased amounts until it's worth £50,000. Does the artist have a moral or legal claim on any of the money it has changed hands for over the years? The answer is surely "no" - isn't it? 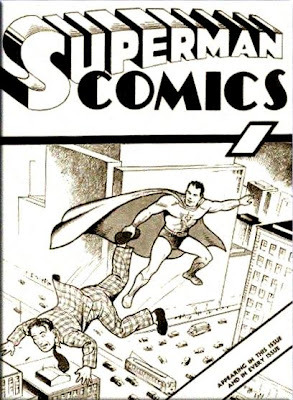 So - what's the difference between those two examples and what happened to SIEGEL and SHUSTER over SUPERMAN, or JACK KIRBY and the many characters he created or co-created for MARVEL or DC COMICS? Or the work LEO BAXENDALE (or any artist you care to name) did for D.C. THOMSON or IPC/FLEETWAY? I would suggest none at all. If you consent to sell something outright for an agreed fee, then it's really nothing to do with you what the purchaser does with his purchase or how much he profits from it in the years to come. If you buy a house for £80,000 and then sell it for £100,000, the previous owner (even if he built the house) is neither legally nor morally entitled to a share of your profit. 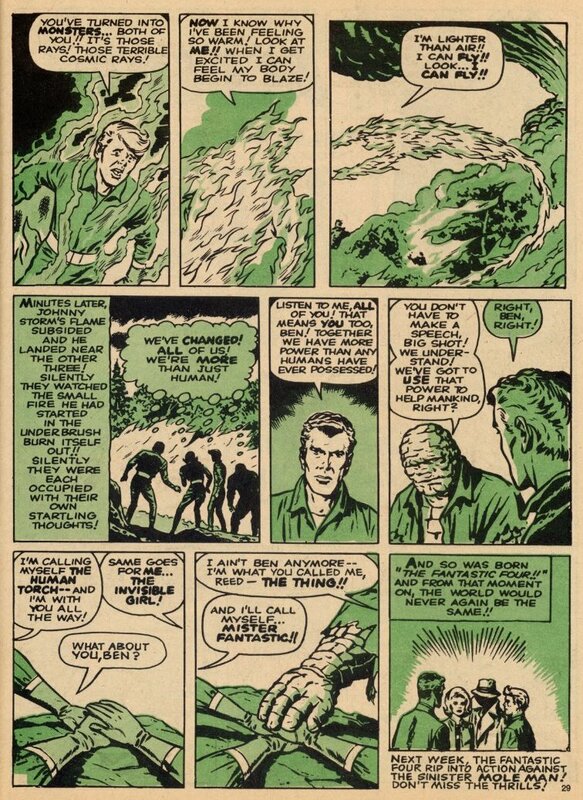 And, back in the day, that's the way it was done in the world of comics. That's not to say that I have anything against present-day creators' rights, profit-sharing, copyright ownership, artwork return, or anything like that - because that's the way things are done nowadays. 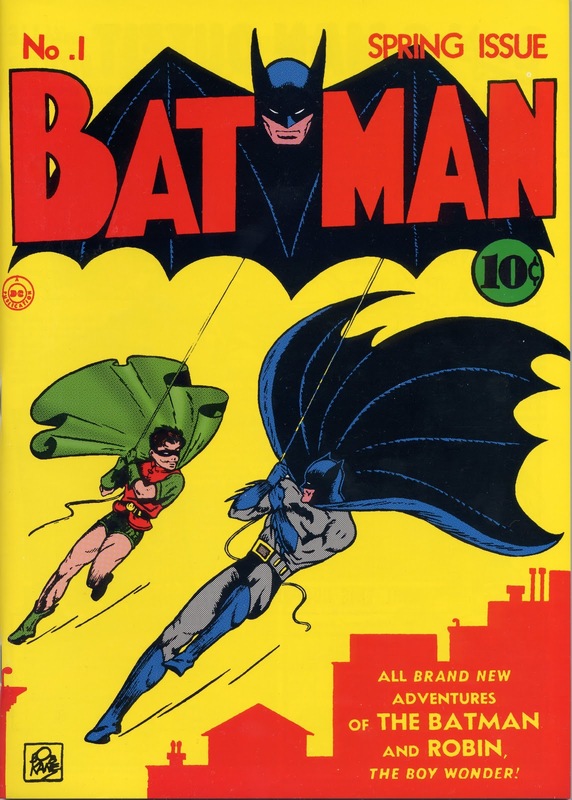 However, back in the 1930s (until the late '70s, early '80s), comics were just a job to the writers and artists - 'twas the publishers who took the financial risk in launching a new comicbook, so why shouldn't their share of the profits proportionately reflect that risk? When a publisher bought a character, they bought it outright - if it was a success, they made money, if it was a failure, they didn't. It's a safe bet that there were a lot more failures than successes in those days. That was just the way the cookie crumbled. Anyone got any thoughts on the matter? Let's hear them. May I present a few logos I lettered relatively recently? horizontal pencil guidelines before inking. 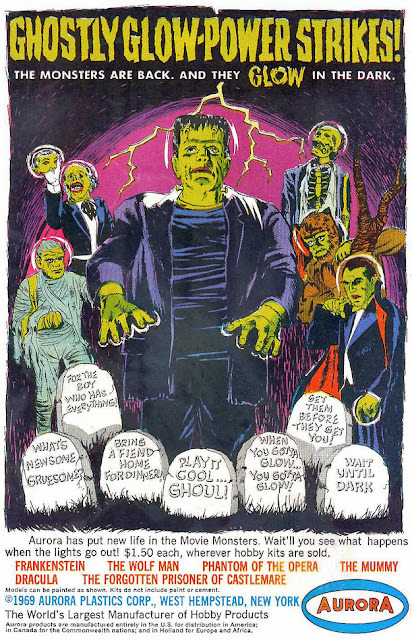 DO YOU REMEMBER THE ILLUSTRATED COMIC JOURNAL? 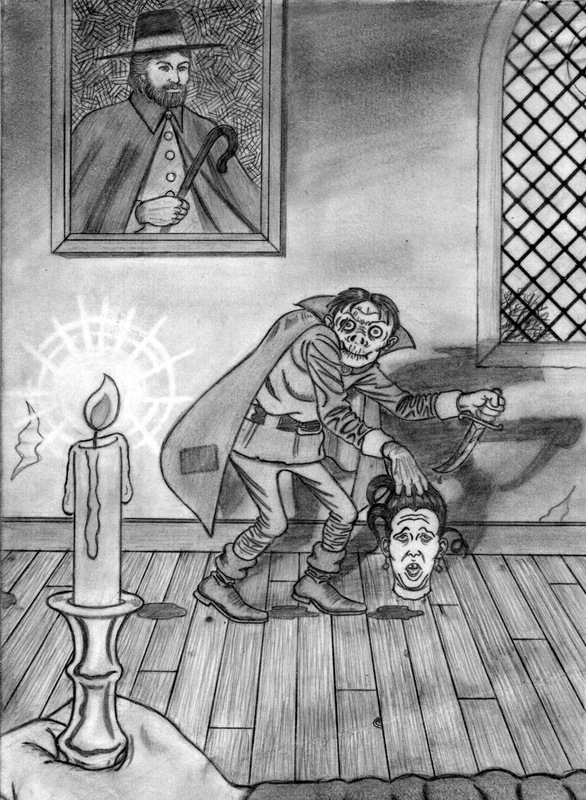 The accompanying illustration is a scan of a very poor quality colour photocopy taken about fourteen or more years ago when I was preparing a cover for The ILLUSTRATED COMIC JOURNAL. The copier (in a local garage of all places) didn't have the right paper and was so badly in need of toner that the resulting copy was unusable. However, it's the only one I have to hand so it'll have to suffice for the moment. 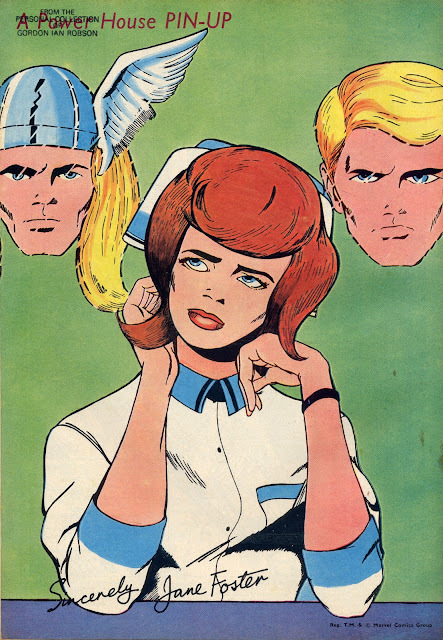 The Illustrated Comic Journal was a fanzine created by ALAN CADWALLANDER back in the early '80s (I think) and then taken over by BRYON WHITWORTH some time later. 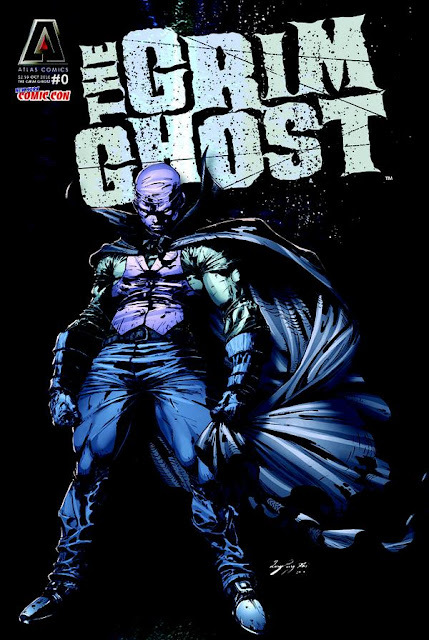 At first it was a black and white A5 publication, but when I became involved as assistant editor in the early '90s or thereabouts, it became A4 with colour covers. Bryon picked the articles and I proofread and corrected them - though he always managed to overlook some of my corrections and add a few new mistakes once the edited version was returned to him. Such were the drawbacks of the pre-computer "cut and paste" method he employed. The late DENIS GIFFORD, celebrated comics historian and collector (and compiler of the A.C.E. section of the mag), was much taken with the new logo I designed, drew, coloured and lettered as it featured his STEADFAST McSTAUNCH character from WHIZZER & CHIPS, saying at the time "What a find in Gordon Robson" (to be sung to the tune of "WHAT A FRIEND WE HAVE IN JESUS" - only kidding) - despite me having been a professional comics contributor for quite a few years by that time. 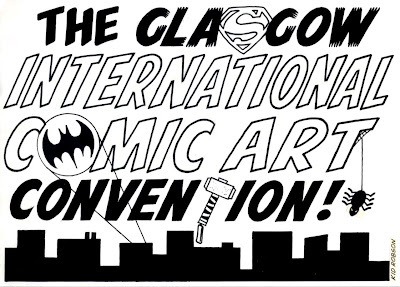 Anyway, I'm quite proud of the logo - everything on it was produced by my own fair hand, with the exception of the words "Illustrated" and "Incorporating", which were done with LETRASET. 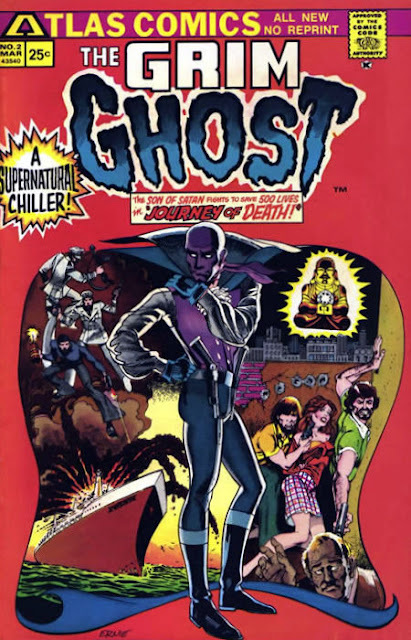 Bryon eventually passed the mag on to other hands and one further issue was produced - then it unfortunately faded into comics limbo. Shame really. and neck - they're far too thin and out of proportion to the rest of the figure. 'missing' part of the picture should look like. only 15 year old schoolboys. "There's Kid over there - I hope he notices me." Here she is, you lucky people, you - the stunning SALMA HAYEK. on the vision that is The Mighty Salma. "My name's Bond - James Bond!" 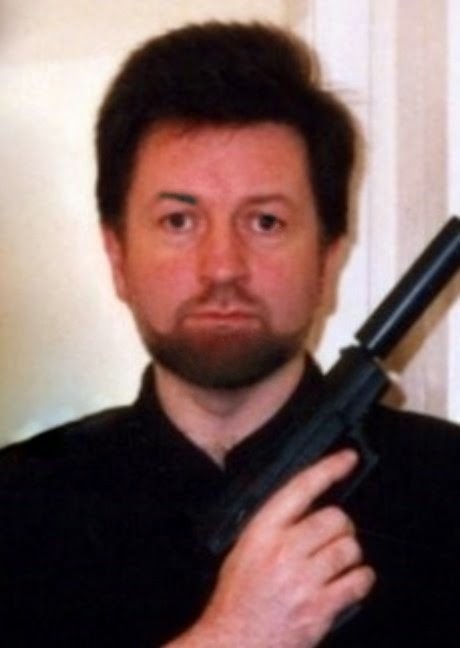 myself as JAMES BOND 007. TOYS one from the '60s). have a beard", I hear you cry. It's funny what you think about when you look at the cover of a book or comic from your past, isn't it? 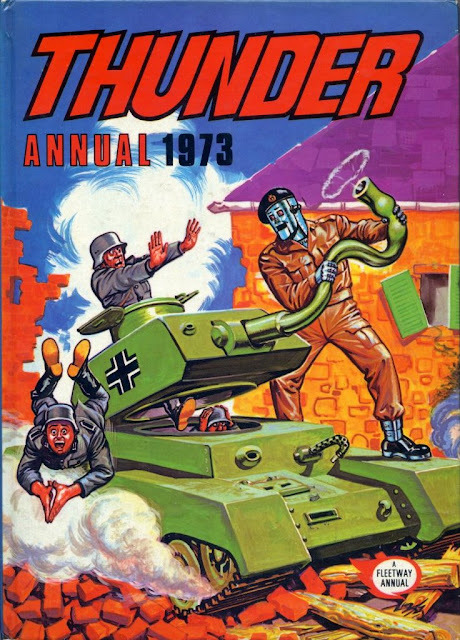 When I cast my gaze over the cover of THUNDER ANNUAL 1972, my mind jumps back to a snowy day in December 1971 when I was given a Christmas tip of 50 pence by one of the households on my paper round. It was presented to me in an envelope marked "milk-boy", and to this day I fervently hope that the envelope meant for me had the same amount as the one I was actually presented with, lo, all those many years ago. 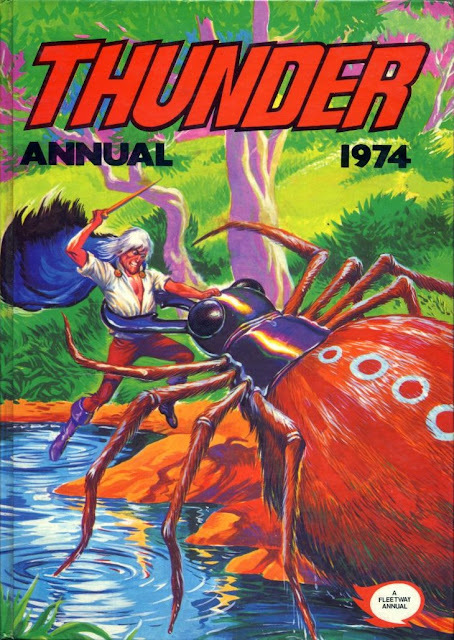 The weekly THUNDER was launched on the 10th October 1970 (dated 17th) and survived for only 22 issues, the last being on the 6th March 1971 (dated 13th) - so had been absent from newsagents' shelves for several months before the Annual hit the shops. 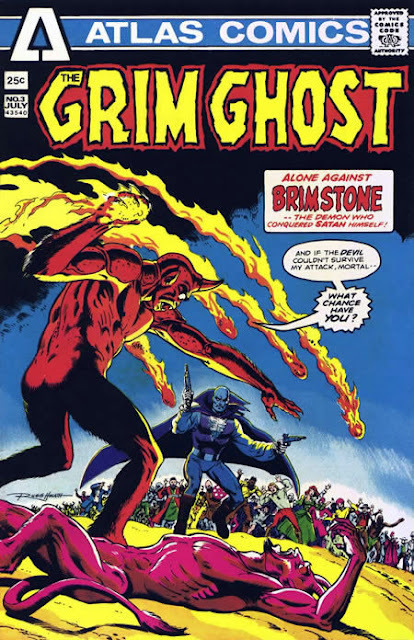 Work on the book had probably begun towards the end of 1970 or the beginning of '71, so it seems obvious that IPC were hoping the comic would have a good long run. Unfortunately, such optimistic aspirations were doomed to dis-appointment. 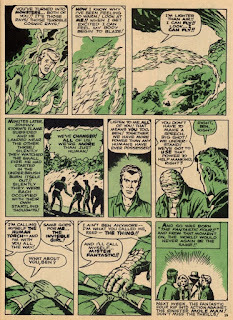 ﻿﻿The comic was absorbed by LION, and two of the most popular strips - ADAM ETERNO and The STEEL COMMANDO (as well as others) - continued for another few years and are still fondly remembered today by readers of the time. I didn't obtain the '73 & '74 Annuals until many years later (probably around 25 years later, in fact), being unaware of their existence at the time (my attention was probably distracted by the arrival of the MARVEL annuals), so their covers don't have quite the same significance for me as the 1972 one. 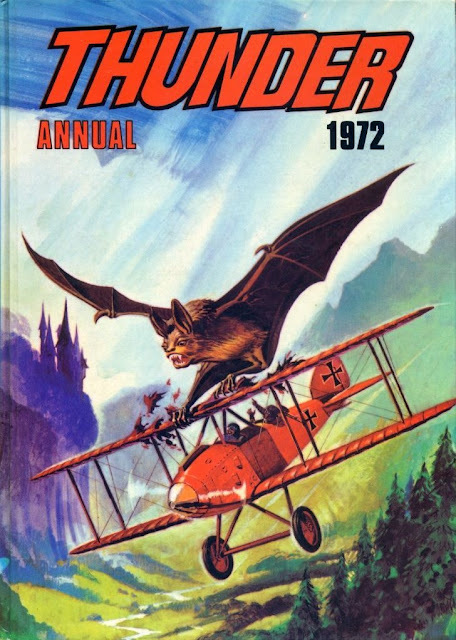 (Obviously the first Annual sold well enough to warrant further editions.) However, for the sake of all you hungry completists out there, I herewith present all three cataclysmic covers anyway - enjoy! See also here and here for more about Thunder. (after TIMELY) and launched an all-out assault on the comics market. 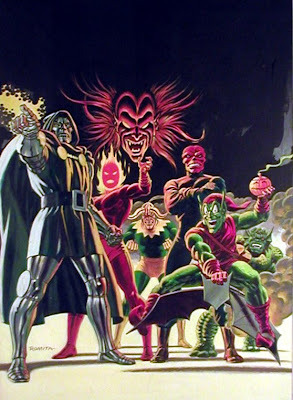 20th century Earth to despatch evil-doers to his new master's domain. 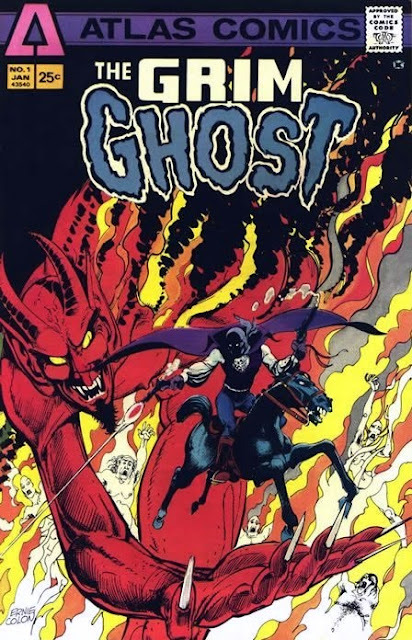 is - you guessed it - The Grim Ghost #s 1 & 2.
comes the very one which was lost or relinquished years before. chance - at a Glasgow comic mart not long after for a mere two quid. two issues was with me at the time. the set. Ah, the sense of accomplishment that fills my soul. entertaining as the short-lived original run. were heading on that particular Saturday morning. another 38 years. In fact, I hope I'm still around also.